Surveillance footage gathered in Incident 3298-1. Probable SCP-3298 circled in foreground. Special Containment Procedures: An automated webcrawling bot, CROSS-29803, has been assigned to monitor online personal advertisements and ‘missed connection’ websites for SCP-3298 sightings, and delete posts as necessary. Civilians suspected to be targeted by SCP-3298 should be detained and interrogated for research purposes. Although the properties of SCP-3298 make disclosure affecting normalcy a low risk, Class B amnestic administration is advised prior to their release. Individuals affected by SCP-3298 should have their movements and communications monitored. Attempts to apprehend SCP-3298 have proven unproductive and have been suspended. Proposals for alternative methods should be submitted to Director Di Vita. It appears at positions between 20m and 8km from the target. At upper distances in this range, it has been viewed through magnification devices, and is anomalously aware of the actions of the target, responding to gestures and expressions outside of human visual ranges. SCP-3298 possesses antimemetic properties. It is rarely noticed by others in the area, although it has been seen to interact with them in a mundane fashion (such as purchasing an item from a store). Observers have no memory of interacting with SCP-3298 and struggle to describe SCP-3298 even when prompted with visual aids. The target of SCP-3298 is also affected by this property to a lesser degree. While they frequently have strong memories of sighting SCP-3298, targets find it increasingly difficult to describe SCP-3298 in detail over time. The only consistently reported feature of SCP-3298 between manifestations is the presence of a blue item of clothing. While SCP-3298 is able to be captured by video and photographic recordings, its antimemetic properties continue to apply to these records. SCP-3298 displays behaviour consistent with non-anomalous humans, albeit varying between appearances. Greeting SCP-3298 will result in positive emotional responses (smiling, waving, etc.) while displays of hostility, anger or irritation will cause SCP-3298 distress and induce it to leave the scene. Despite responding positively to greetings, SCP-3298 avoids contact with targets, and attempting to approach SCP-3298 will also cause its departure. It is hypothesised that SCP-3298 projects a localised probability-altering field through which it evades contact with others (see Addendum 3298-2). If a positive acknowledgement is given to SCP-3298, the target will continue to report SCP-3298 sightings for a period from 1 day to ██ years, with SCP-3298 usually appearing at weekly to monthly intervals over longer periods. Its behaviour at these times is consistent with that in its first appearance. Not acknowledging or acting negatively towards SCP-3298 will end its manifestations. Targets affected by SCP-3298 frequently report feelings of melancholy and loneliness; however, this does not significantly differ from control subjects in comparable non-anomalous situations, and there is no evidence SCP-3298 exhibits cognitohazardous properties. A period of SCP-3298 appearances to a target will conclude when the target reports receiving a message from SCP-3298. This occurs in the form of a visual hallucination where text being viewed by the target will change to a relevant message, which will be recognised as being related to SCP-3298 by the target even if the content is vague. This remains fixed to the target over time but is unable to be seen by other observers. Materials analysis of affected documents confirms the effect is hallucinatory only. While the content of these messages varies widely, targets consistently describe them as positive and affirmatory, and often results in the resolution of negative emotions related to SCP-3298. Text: Your dog seems to love you. You must be a good person. Text: Thanks for saying hi, it made my day. Text: I know what I did was a bit weird and might have been inappropriate. I hope I didn’t bother you. Text: If you go on Thursday evenings, you can get half-price admission. Text: I really enjoyed seeing you, and I hope you felt the same way about me. Every time I saw you, though, it hurt me a little bit more. I thought, if you felt the same way, wasn’t I hurting you, too? That’s what I was afraid of, and I hope I never made you feel like that. That’s why I’m going to say goodbye from now. Text: Sorry, I never really learned how to properly talk to people. Context: 6 days after first manifestation, French subtitle of film ‘Dunkirk’. Text: I love what you did with your hair. Addendum 3298-2: On 01/02/20██, Foundation Agent Jeunet reported suspicions of being affected by SCP-3298 after a sighting of an individual in Toledo, Spain, which was deemed as a likely case of SCP-3298 after assessment by Antimemetics Division staff. This situation was considered an opportunity to apprehend SCP-3298 and an operation was planned in which Agent Jeunet would be constantly tailed by 2 colleagues while being remotely monitored. SCP-3298 subsequently manifested in the presence of Agent Jeunet outside the Madrid Atocha railway station. A transcript of the encounter is attached below. Agent Jeunet sights SCP-3298 outside the Atocha station on the opposite side of the Paseo de la Infanta Isabel. 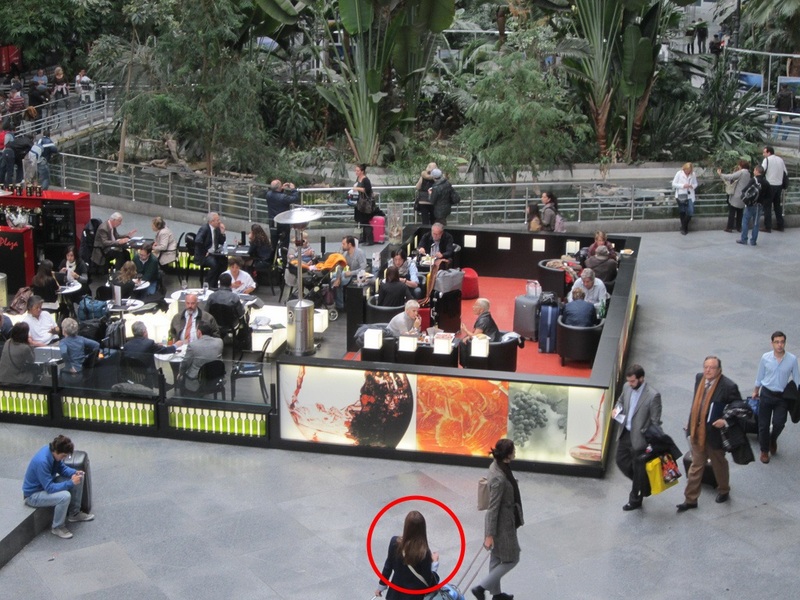 SCP-3298 is later described by Agent Jeunet and civilian witnesses (under the effect of mnestic drugs) as an early-30s Spanish woman approximately 170cm in height, with shoulder-length brown hair and wearing a navy blue jacket and khaki pants (see image). Agent Jeunet waves to SCP-3298, who returns the gesture, and waits for traffic lights to change in order to cross the street to SCP-3298. The lights do not change for 8 minutes; after this time, Agents Amenábar and Ephron arrive on the scene in the guise of Madrid Municipal Police officers and halt traffic to allow Agent Jeunet to cross. When this occurs, SCP-3298 assumes a worried expression and begins walking towards the station entrance. All agents pursue SCP-3298 into the station. Civilian crowds outside are larger than usual for the time of day and Agent Jeunet has difficulty passing through them; these civilians pay little attention to the Foundation agents and react more slowly than expected to orders to clear the way. SCP-3298 is seen inside the station having crossed the ticket barrier. Upon passing through, the barrier returns an error message when Agent Jeunet's transport card is swiped. Agent Jeunet leaps the barrier but a Municipal Police officer attempts to intervene. This officer does not respond to Agent Jeunet showing police identification and the agents are forced to subdue him. At this point, SCP-3298 has boarded the 1606 Line C-7 train. Before any agents are able to board, the doors close and the train departs ahead of schedule at 1603 despite efforts from both the agents on site and in the operations center to contact the driver and prevent it from leaving. The train is stopped at the next station (Recoletos) and secured by Foundation operatives with the pretext of an anti-terrorist operation. Although there is no evidence of any passenger having left the train prior to this search, SCP-3298 is not found. A review of surveillance footage observes SCP-3298 passing between carriages out of view of cameras, but not appearing in the next carriage. In this segment of video, SCP-3298 is crying. Given the significant expenditure of resources in this operation for little result, no further attempts to apprehend SCP-3298 are planned. On 28/02/20██, Agent Jeunet reported seeing a message from SCP-3298 during a routine review of an unrelated Foundation file, which has been reproduced below. Agent Jeunet subsequently requested and was granted 1 week of personal leave. Sometimes I see someone on the street and I feel like we have a special connection. You have no idea how much I want to meet them properly, but it's better for everyone that I don't. I have one request, if it's not too much trouble. I know I have no right to ask this, but it would mean a lot to me, if you could. 1. Presumed singular; no simultaneous appearances of SCP-3298 have been recorded, but the possibility of multiple SCP-3298 entities has not been excluded.